Ford has announced that it will showcase a prototype solar-powered hybrid car at next week’s Consumer Electronics Show (CES) in Las Vegas. 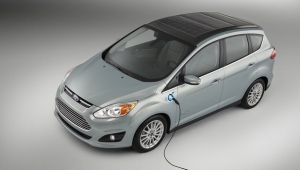 The Ford C-Max Solar Energi features many of the same characteristics as a plug-in hybrid, but does not need to be hooked up to a power grid to recharge. The Solar Energi Concept has a solar panel system on the roof which tracks the position of the sun. The company said it can draw power equal to a four-hour battery charge. Fully charged the car could travel for up to 21 miles powered just on electricity. The solar panel roof will have a special solar concentrator lens similar to a magnifying glass. The Fresnal lens will follow the movement of the sun from east to west and direct sunlight to the solar cells which project researchers say boosts the impact of sunlight by a factor of eight. Ford claim that a day’s worth of sunlight will produce the same performance from the Solar Energi Concept as is given by their conventional plug-in hybrid car. Is this a practical contribution to the evolution of electric vehicles? Tells what you think.